Successfully Added Hidden Cellphone Jammer (Cigarette Pack) to your Shopping Cart. Say hello to this the smallest, lightest and most sophisticated digital cell phone jammer ever! This cigarette pack device is your best bet to prevent disturbances or noise from phone blabbermouths at short distances. Don't you hate it when you're in a meeting or in class, and someone's having a cellphone conversation right next to you? Or maybe you just want a peaceful ride on the train or bus, but someone with a big mouth keeps talking to his stupid buddy about how he scored majorly with this girl last night? Solution? Just use this ultra powerful and highly effective cell phone cigarette jammer which disablesany cell phone in distance, stopping all signals on the GSM, DCS, PHS, and 3G bands without interrupting any other electronic device. Trust us - this will save your sanity! 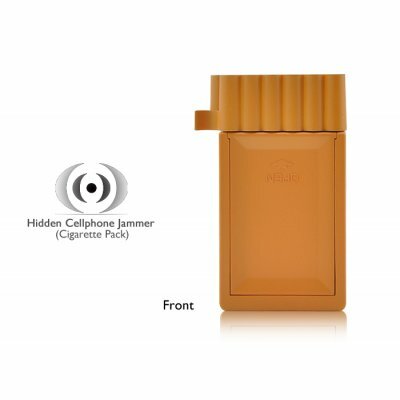 It's small, portable and cigarette pack shaped so you can place it in any empty regular size cigarette box for maximum camouflage. Or keep it inside your bad, hidden under the seat of your car, anywhere you want and no one will ever know their cellphone signals are being scrambled! So easy to use with one button on/off switch and a green light to indicate the device is working, you don’t have to deal with antennas to install or setting up/configuring any software. This jammer is ready straight out of the box for instant jamming and unjamming. Use this mini portable cell phone signal blocker wherever people are likely to be rude and obnoxious with their cellphones like the theater, train, meeting rooms, class. Get yours now at an excellent factory-direct wholesale price, brought to you by the online leader in Jammers - Chinavasion. This product will be shipped from separate warehouse by express courier or standard air mail according to your checkout choices; actual courier company may vary from main order products due to different warehouse origin. Please confirm with customer support if you received part of the order and are still waiting for the other. .